The dealers' room, pleasantly full of books. No, really, Jon did understand all of Farah's questions. 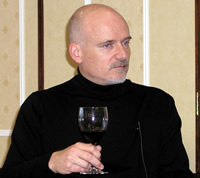 Jon Courtenay Grimwood in thoughtful mood. Claire McSkelly demonstrates the latest in fashion accessories, a handbag disguised as a book. Dinner, at which Ian Watson demonstrates the fine art of knowing where the camera is. Farah Mendlesohn and Ken MacLeod are selling True Knowledge. 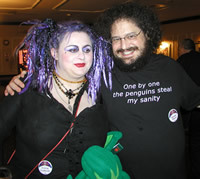 Feòrag NicBhride and Charlie Stross - and I always thought it was Cthulhu who cost you sanity points. 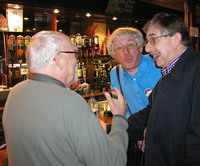 Dave Langford hams it up for the camera while Peter Weston enjoys one of Harry Harrison's jokes .